This article can be viewed as a brief discussion on the performance of cables throughout different tiers. This is just to provide a rough picture of the world of high-end upgrade cables, based on my experience. I can imagine that there’s a healthy skepticism about the actual increase in performance when you move up higher in quality. And I’m not referring to cable skeptics – I have no interest in ‘converting’ anyone, or starting a cable discussion. My goal is to provide a bit information for those already interested. As I’ve been a cable enthusiast for a couple of years now, I’ve been able to experience a relatively large number of upgrade cables (an estimate would be somewhere between 40 – 50). I can look back at what I’ve experienced while gradually moving up through the world of cables, while also steadily learning to understand different components of analyzing sound. I too was very skeptic that cables could improve – and consistently remained skeptical, even though I gradually experienced an improvement at different price points. The problem is that it is very hard to imagine something beyond your own experience (Plato’s Cave, anyone?). Before I start, I would like to point out that I’m not advocating that anyone should buy a high-end cable. I find it regrettable cables are incredibly expensive, and that the industry has taken a turn to the worse when it comes to increasing prices. I have been fortunate to receive samples on a few occasions, but in the majority of cases I paid for them myself, so I am very much in touch with this issue. However, as I will argue in a bit I don’t believe this is an issue specific to cables; rather, the increasing price you need to pay for an improvement in performance is very similar if not identical to that of iems. Do upgrade cables really work? There’s a very wide variety of cables in different price ranges available, with most ranging up from $100 up to $2500 at least, and some even further. But, there’s still very little information on the general performance of cables, and especially how this steadily increases throughout different price ranges. This is of course can largely be attributed to the lingering skepticism throughout the West towards cables. The majority of people in the US and Europe do not believe in cables, which is reflected in sites where we come to meet such as Head-Fi.org. So it requires a big leap of faith to lay down $300 or more, especially since there are almost no places to demo cables – and understandably so. So I imagine that even when people tentatively want to try a cable but are naturally still hesitant, they either go for a $100 cable or just switch stock cables to experiment. Consequentially, they come to the conclusion that they just wasted their precious earned money since they can’t hear a difference. I’ll tell you now – even for trained ears it is extremely difficult to analyze and compare cheap cables. Due to the quality of the material, the extension is not very good so notes are more fuzzy and harder to compare, plus in most cases manufacturers use very similar copper or SPC wires. Our world view is determined by the culture we live in, and shaped by the people around us. In Eastern Asia, the situation is reversed. If you’d take a look at Asian fora such as andaudio.com or erji.net, the general consensus is that cables do play a role in determining aspects of the signature or performance, and there’s little debate on the issue. Accordingly, more people find it worthwhile to invest in upgrade cables. The difference can at least partially be explained by the fact that cities like Tokyo, Hong Kong and Singapore have evolved into major audio hotspots, where you can extensively demo every piece of equipment including cables. However, while speculative, we can also take the characteristics of the type of music people listen to in different cultures into account, such as range, pitch, flow and rhythm (Born & Hesmondhalgh, 2000), as well as innate biological and cultural differences that shape our hearing, such as that Asian voices tend have a slightly higher pitch and different rhythm (e.g. Brunelle & Kirby, 2016; Ohara, 1999). If we consider that one of the most fundamental improvements of high-end cable is its effect on the highest frequencies due to properties of the wires (the highest frequencies roll of strongest with lower quality), the connection with a sensitivity towards higher pitch is again speculative, but not unthinkable. The general concept of diminishing returns is well-known. When it comes to iems, you can get a great sounding iem for $300; some examples are the Dunu DN2000j or Oriveti Primacy. These iems are a good deal better than $100 their entry level counterparts. When you experience such an iem for the first time, it’s hard to imagine you’re missing something, especially after already witnessing such an improvement from the lower segment. The bass, mids, and treble are all there, the stage is large enough for the instrument positioning, and the presentation as a whole feels fairly detailed. Nevertheless , when you move up to a $1000 iem, the difference can feel quite significant. The stage is larger, the midrange might have more body, and the level of detail again improves. The whole image gains in clarity, often feeling like a ‘veil has been removed’. Yet, when you move on to a TOTL $1600 ciem, there’s usually no doubt there’s again a significant improvement: the depth of the stage might result in a more effortless separation, and the resolution relies on its treble extension rather than the brightness of the signature, so the tone might be more natural, while the presentation is nevertheless more detailed (I wrote a piece about the difference between $300 and $1600 iem a while back on Headfonics). While it’s hard to imagine, similar incremental improvements can more or less be experiences with cables. Admittedly, while the cost for improvement might be a $100 in the lower segment, it rapidly climes with steps of $500 shortly after – just as we’ve seen with iems. You can get a solid cable for roughly $150-$200. Some examples are the Effect Audio Ares II or PWaudio’s no 5. Depending on the listener, the effects might vary from negligible, to having a nice moderate effect to polish up an iem’s signature, by adding a bit of warmth or extension for example. Depending on the listener, the difference might be considered around 5%-10% (just as a rough estimation to paint a picture). But when you arrive at a quality $350 silver cable, the effect should be more clearly noticeable, while still remaining affordable. The extension will be slightly better, possible resulting in better transparency, resolution, or airiness. Sometimes silver cables might be brighter, resulting in more apparent clarity. We might think of this effect as contributing to 20% of the sound. This range is what I would consider the cable equivalent of an iem like the DN2000j or Primacy. Significantly better than a $150 cable, but after this point the price to increase its performance will start to steeply rise. Excellent value. Moving up the area of $700 – $1000 cables, the price range I consider ‘top-of-the-line’ for cables. Similar to $1600 TOTL ciems, there’s a wide range of cables that each have their own signature, performance, as well as ergonomics. They’re all very different, but generally should have similar performance when all aspects are averaged together. Much like ciems, some focus on tone, resolution, stage, or certain aspects of the signature (bass, mids or treble). And it’s almost pick 2 or so – you can’t have it all. When we move into this range, we’ve made a fairly big leap in price compared to a quality silver cable – $500 or more. But we’ve also made a significant jump in quality. The cable’s unique signature starts to play a more prominent role in the sound. For me personally, a cable in this range will determine something in the order of 30% of the sound. In this case, the listener’s personal preference and taste of music might become a better indicator than the actual iem with which it is paired. For instance, when I want to listen to pop, rock or electronic music, the cable pairing is more important for me than the iem; I have favorite cables for pop or electronic music, and can use those cables with any iem – a brighter iem like NT6pro or S-EM9, but also a warmer midcentric iem like Zeus-XIV or Prelude. Some examples of different signatures and performance in this range are Effect Audio’s Leonidas, which has a very uncolored signature which a punchy bass as special feature, as well as a nice clean stage and good transparency and resolution. It’s a precise and technical sound, while its powerful low end give’s it something extra – a cable I like for fast electronic music. Labkable’s Samurai III shares some general similarities, as both have an airy stage, and a fairly neutral but transparent signature. While the Samurai’s low end is not as powerful, it has a nice coloration in the upper midrange that gives some extra sparkle, as well as a slightly warmer midrange. The Rhapsodio Golden is a very unique cable, but hard to recommend because of its specific sound and stiff ergonomics. Due to its enhanced mid- and upper bass, it creates particularly thick notes and a full sound, although its stage isn’t very airy. The warmth from the low end is countered by a brighter upper midrange and treble. Upper midrange notes are thick and really pop out, making it highly engaging and perfect for synthetic-based melodies, even though its resolution and imaging is not very impressive – this is the (original) K10 of cables when it comes to sound. Though different than the Samurai III, both are favorites for pop or melodious electronic music. The recently discussed PWaudio 1960 2-wire is unique due to its dark, warm, but smooth and resolving presentation. There’s a certain sensuality to its presentation that makes it involving for vocals, while being one of the most suitable to soften harsher treble. And then there’s the plusSound Gold-Plated Copper 8-braid, that performs admirably when it comes to stage airiness, resolution and transparency, but excels when it comes to its tonality – this remains one of my favorite cables for daily use. Due to its smooth, natural and accurate tone, suited for most instrument- or vocal-based music. After hearing quality cables in the ‘top tier’, is the difference in this next range still discernible? I can only refer to the two cables I own(ed), but the answer is yes. A year ago I decided to randomly sell a bunch of stuff to invest in a few high-end cables for a shootout I was planning for Headfonics. After receiving the first few, I was impressed with the resolution of the Wagnus Frosty Sheep and Rhapsodio Copper Wizard 8-braid (both $1000). But when I heard the SilverFi IEM-R2, I immediately recognized this was a cable that took sound to a next level. Although its midrange was pretty forward and warm, it easily matched the resolution and transparency of the other two, while adding a level of naturalness that could not be compared. With its natural tone and forward midrange, this was a specialist for male vocals, and a generally very romantic sound – a signature resembling the upcoming Warbler Prelude. While I’d be hesitant to ever call Labkable’s Pandora ‘natural’ due to its reference sound, its resolution and transparency easily bests the lower tier, while adding both an engaging, punchy bass, as well as wide and deep holographic stage. The Jomo Samba of upgrade cables. Due to its brighter than neutral tone, high level of precision, and punchy bass, one of my favorites for electronic music. Paying 2K for an iem is an extraordinary amount, something we’ve only started to see since about a year – let alone for a cable. This is a shocking statement to make, but I would easily state that the 2 2K cables I have had a pleasure to listen to are both a clear, and by objective audiophile standards significant, step up from any cable below. In both cases, the ‘wow’ effect of these cables is strong and immediate – within a minute of listening I could tell this was something special. PWaudio’s 1960 4-wire’s black background, treble sparkle, and high level of both transparency and resolution is a prominent feature with any pairing, and as such has a discerning role on the picture you’re seeing. A dark atmosphere filled with transparent detailed elements, regardless if the iem is innately midcentric or bright. The astonishing ability to bring minor details so apparently to the foreground. I’ve never been one to care much about the effects cables have on a stage, since they’re mostly relatively minor. Until I heard the SilverFi IEM-R4. This isn’t only the largest stage in its dimensions, it’s also one of the airiest. This is truly a holographic stage. ‘Neutral’ has many different interpretations, but the best one is when it refers to a balance between the frequencies, as well as an accurate tone. The SilverFi house sound has always been the very definition of naturalness. A slightly warm but not too forward midrange, and a beautiful treble tone. Much like the 4-wire, its transparency and resolution cannot be compared to any cable below; so it doesn’t have to be bright to be one of the most detailed, relying on its stage and transparency. When you’re listening to an iem paired to the IEM-R4, the stage is mostly determined by the cable, as is the naturalness of the tone. When you’re listening to one of these cables, the effect on an iem’s signature becomes so large, you’re almost listening to equal parts cable and iem. Accordingly, the difference between iems paired with such a cable becomes smaller, since a large portion of the sound is attributed to the cable. To picture what I mean with this, imagine two settings: one is a dark night in a rural area far from the city lights, with a starry night shining above you. There’s a spotlight fixated on the singer performing for you. The other is a grassy meadow on a sunny spring day, with a forest in the background. In this analogy, the distance to the singer, and the pitch and power of their voice is the variance of the iem – but the setting I described is from the cable. Cables are difficult to analyze, especially in the lower tiers. As the quality goes up, the differences become larger and easier discernible. You need to more of a pro to analyze a $100 cable compared to a $1000 one. But I’ll give some basic pointers based on the ‘MikePortnoy philosophy’ my fellow reviewer and friend handed down to me a few years back. The key of breaking down a cable’s signature lies in understanding the relation between the (mid-)bass and the stage, since it determines a large deal of the presentation. So when you compare two cables, try to listen at how the different the bass is, and how it accordingly affects the stage. For instance, is the stage airier or even completely clean? Then most likely the mid- or upper- bass is attenuated. If a stage is still clean while having low end power (like Leonidas or Pandora), there’s most likely an increase in control, and possibly in sub- or mid-bass but not upper-bass. Accordingly, the this might take some of the warmth out of the midrange. As the size and warmth of midrange notes are strongly related to the bass presentation, thicker notes are usually an indication of enhanced mid- or upper-bass. The clarity of the signature can be deduced by the relation between the quantity of bass will combined with the prominence of the treble. Determining treble extension might require a bit more practice and understanding, but it can usually be determined from the definition of notes, as well as factors as transparency or the airiness surrounding notes and vocals. Since people’s sensitivity for sound plays a role when it comes to cables, I would never recommend point blank paying a large amount for a high-end cable if you don’t have any experience with them. The effect of a more expensive cable will be easier noticeable than a cheaper cable, but even then there’s never a guarantee the result will be satisfactory at a personal level. Cables might be expensive, maybe even too expensive, but there is a fundamental reason why some cables are more expensive than others. Factors as the amount of wires (e.g. 4 vs. 8), or type of material (e.g. silver vs. copper), are negligible compared to the quality of the wires used. That’s why a basic 4-wire silver cable can range between $50 or $1000. Sadly enough, you can’t cut corners here. If a cable seems too good to be true (like a silver 8-braid costing new $200), it’s safe to say it is. 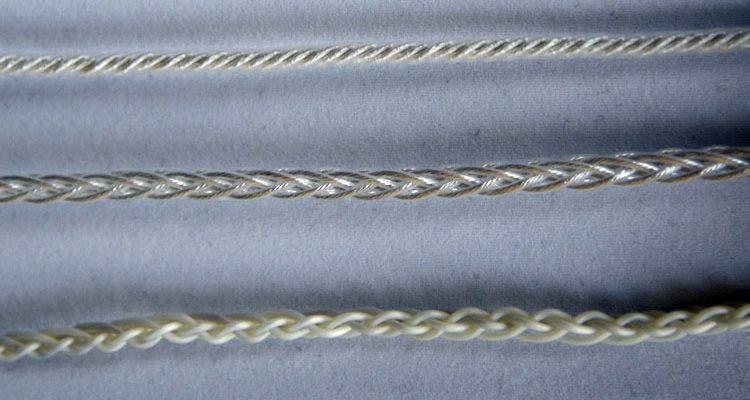 Instead, if you are interested in trying a high-end cable for the first time, I would strongly advise the following: try buying a second hand silver cable from a respected cable manufacturer (you can find many in the for-sale sections of different fora). That way you’re guaranteed a certain quality, and if you find it’s not for you, you can sell it at a minimal loss. Furthermore, you don’t need to be an expert with extremely sensitive hearing to hear the benefits of a cable. When I started out in this hobby a couple of years back, I didn’t know what a soundstage was, or even the difference between the upper midrange or treble. I happened to roll in the world of cables because a friend told me ‘I had to get one in case the stock cable broke’, but even at the time it was easily discernible that the silver cable (a Toxic Silver Widow) cleaned up the presentation and made it more detailed. Of course, it would take time and experience to understand the mechanisms, but the effect was there. Born, G., & Hesmondhalgh, D. (2000). Western music and its others: Difference, representation, and appropriation in music. University of California Press. Brunelle, M., & Kirby, J. (2016). Tone and phonation in Southeast Asian languages. Language and Linguistics Compass, 10(4), 191-207. Ohara, Y. (1999). Performing gender through voice pitch: A cross-cultural analysis of Japanese and American English. In Wahrnehmung und Herstellung von Geschlecht (pp. 105-116). VS Verlag für Sozialwissenschaften. I totally understand the level of skepticism toward after-market cables – ridiculous pricing yet very few can testify whether they can hear the difference. Many will buy them just for the sake of the good looks & showing off factor rather than hearing the actual sound improvements. This sickens me terribly but hey it’s their money. The stock cables is not necessarily bad but there’s always room for more improvements plus a variety of sound signatures. Problem such as “veiled”, rolled-off, compressed sound,bass impact lacking, transparency and details, smallish sound stage, air and extension etc can be easily tackled with the right choices of quality cables and connectors. In my limited experience, Senny and Audeze are the ones to keep as they scale and improve to a much greater sounding cans with the RIGHT cable. I went to CanJam and shows every year, brought my own trusty LCD X and HD650 with champion cables I crafted and listened to a bunch new headphones out there ; Elear, Flow, 800S, Fostex, Ether, Hifiman etc. At the end I still very much in love with my X plus the cable. This proves me that having a good cable is an excellent investment and It saves me in great deal from the “upgradetitis”. I think its more about marketing and information about cables (scarce) that created a niche market for medium to high cables. People tend to not look at the complete picture on what composes an earphone and the quality of each of the elements.The companies knows that and tend to cheap out on the cables. it is a bit sad because here you all try so much to educate people on a world that is right in front of them and isn t that much more expensive since there are earphones for all kinds of budget and would make a huge difference. As someone who is just beginning his own journey into high-end upgrade cables, I can attest to how difficult it is isolate exactly how the cable is changing the sound, even though the change itself is stark and apparent. This article is already helping me sift through the sonics of the cables I am testing. Thanks Pinky. When I first started listening to cables, it seemed difficult, almost impossible to pinpoint the differences. Trying to analyse it resulted in a lot of self-doubting, lol! What I recommend is giving yourself a lot of time with a cable, maybe a day or so, listening to a wide variety of music with a certain iem. You will probably notice that some tracks sound better than with the stock pairing, or your choice of music has even shifted towards a certain genre. Then listen to that range of music with a different cable, and different songs or genres will pop out. After that, it’s a case of trying to figure out why you were drawn more to the different music. Was the midrange warmer and more emotional, or did the stage have more clarity and better separation, making it more suitable for fast rock or EDM? After a while, this process of deduction will become faster and more automatic.